Participants: Stuart Andrew MP, John Howell MP, Jessica Lee MP, Paul Uppal MP. In November 2012, CFI led a security and business orientated delegation to Israel and the West Bank for four Conservative MPs. The trip coincided with an escalation of rocket fire from Gaza into southern Israel and Operation Pillar of Defence, giving the participants an immediate insight into the many security threats facing Israel. The realities of this were dramatically brought home when the group heard the air-raid sirens across Jerusalem, warning of incoming rocket fire. The group were further affected by the firing of long-range rockets into Tel Aviv; air-raid sirens prompted the bus taking them to the British Ambassador’s Residence to turn back to Jerusalem. 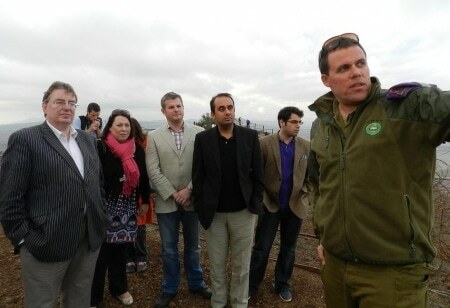 During a day-long visit to the north of Israel, the group travelled to the Lebanese and Syrian borders for security briefings with the IDF spokespersons unit which covered recent incidents of Syrian artillery fire into Israel. "Experiencing the geography and being able to see for myself the close proximity of all the borders and the UN bases within was extremely valuable. I was also reassured to hear the account from the IDF commander regarding the measured response from Israel following the Syrian missile attacks. In light of the ever-changing situation across the whole region, I do think it is important for parliamentarians to be better informed as to the continued threats and vulnerabilities surrounding Israel." "Being an MP means you need to understand a variety of issues and I've always found that there is no better way of doing that than being there to see it for yourself. The visit today has been invaluable and provided an insight to the complexities and the significance of the geography. Seeing the borders of Lebanon and Syria has really helped me to understand the challenges that are faced in the region." Whilst in Jerusalem, the MPs had the opportunity to explore the historic Old City, were given a tour of the security barrier by the architect of the barrier, Danny Tirza, and met with Benny Begin MK, the son of former Israeli PM Menachem Begin. The group also visited a Teva Pharmaceuticals factory to see first-hand some of Israel’s ground-breaking medical research. On their visit to the Palestinian Authority, the delegation visited Rawabi, the first Palestinian-planned city, which is developing at an impressive rate. The group had lunch with leading Palestinian politicians and businessmen, including Bashar Masri, the Palestinian-American entrepreneur behind the Rawabi project. Paul Uppal, MP for Wolverhampton South West, described his experience of hearing the air raid sirens in Jerusalem in a Conservative Home article, in which he welcomed the Government’s stance that Hamas “bears principal responsibility” for the recent conflict. John Howell, MP for Henley, wrote on The Commentator that “Israel’s right to defend itself should remain of primary concern for Israel”, citing security threats on Israel’s borders with Syria, Lebanon, the West Bank and Gaza.